Figure 1: USS Idaho (Battleship No. 24) fitting out at the Cramp shipyard, Philadelphia, Pennsylvania, circa 1906. Photograph from the Bureau of Ships Collection in the US National Archives. Click on photograph for larger image. Figure 2: USS Idaho (Battleship No. 24) and USS Mississippi (Battleship No. 23) fitting out at the Cramp shipyard, Philadelphia, Pennsylvania, circa late 1907 or early 1908. Mississippi, commissioned in February 1908, is presumably the more complete ship, in the center of the photograph. Courtesy of Ted Stone, 1977. US Naval Historical Center Photograph. Click on photograph for larger image. Figure 3: USS Idaho (Battleship No. 24) photographed on 14 September 1908, refitted with a "cage" mainmast but still wearing "white and buff" paint. US Naval Historical Center Photograph. Click on photograph for larger image. 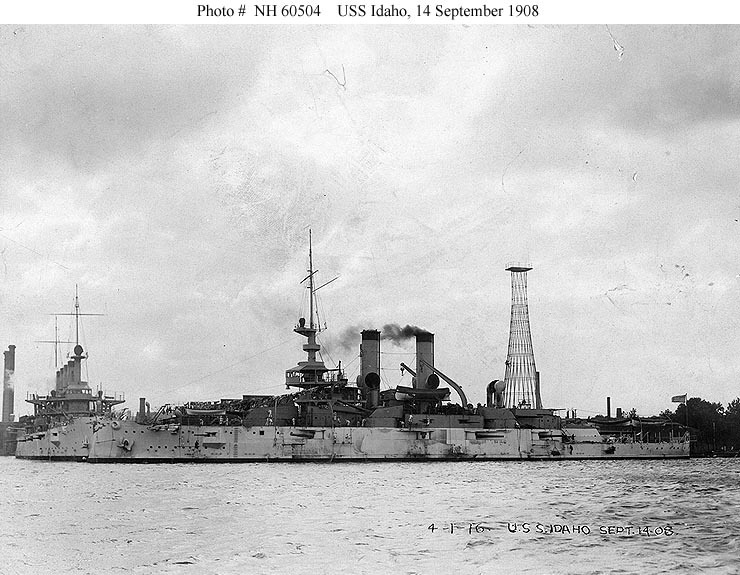 Figure 4: USS Idaho (Battleship No. 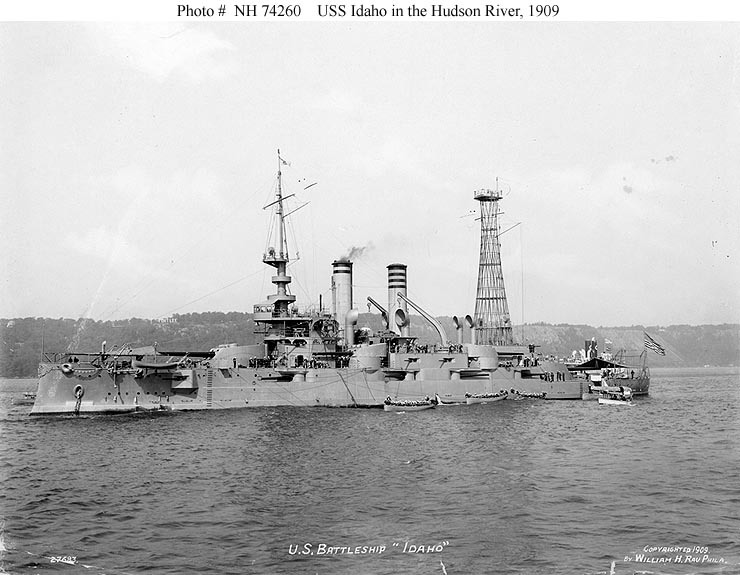 24) in the Hudson River off Fort Lee, New Jersey, 1909. Photographed by William H. Rau. US Naval Historical Center Photograph. Click on photograph for larger image. Figure 5: USS Idaho (Battleship No. 24) photographed in 1909. Photograph from the Bureau of Ships Collection in the US National Archives. Click on photograph for larger image. Figure 6: USS Idaho (Battleship No. 24) photographed on 25 July 1909. Photograph from the Bureau of Ships Collection in the US National Archives. Click on photograph for larger image. Figure 7: USS Idaho (Battleship No. 24) dressed with flags during the Naval Review off New York City, October 1912. Photograph from the Bureau of Ships Collection in the US National Archives. Click on photograph for larger image. 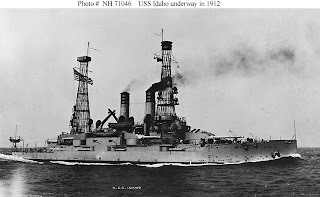 Figure 8: USS Idaho (Battleship No. 24) underway in 1912. Photographed by O.W. Waterman, Hampton, Virginia. US Naval Historical Center Photograph. Click on photograph for larger image. Figure 9: Greek Battleship Lemnos dressed with flags at Smyrna, Turkey, in 1919, possibly on 15 September. She is flying the Greek flag at the foremast peak and the Italian flag at the mainmast peak. Photographed by Wayne. 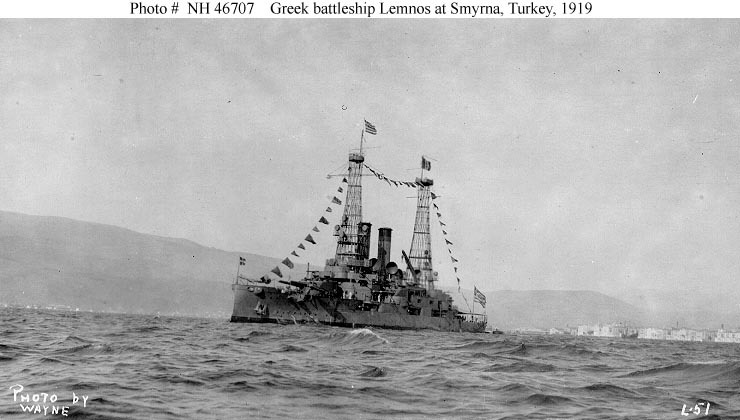 Lemnos was the former USS Idaho (Battleship No. 24). US Naval Historical Center Photograph. Click on photograph for larger image. Figure 10: Greek Battleship Lemnos firing a salute to US Navy Admiral Mark L. Bristol, at Smyrna, Turkey, 15 September 1919. Lemnos is flying the US and Greek flags at the foremast peak and the Italian flag at the mainmast peak. A British D-class light cruiser is in the right distance, also with the Italian flag at the mainmast peak. 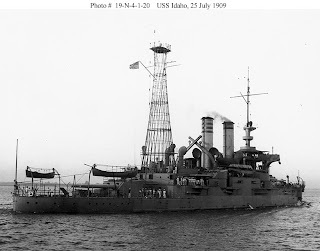 Lemnos was the former USS Idaho (Battleship No. 24). US Naval Historical Center Photograph. Click on photograph for larger image. Figure 11: Greek battleship Lemnos at Constantinople, Turkey, probably in 1919. 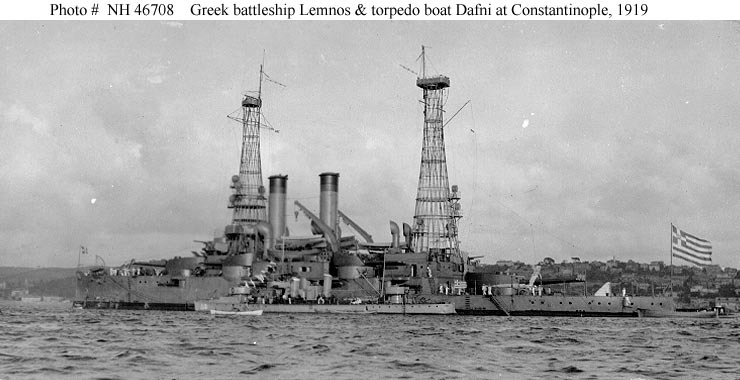 The Greek torpedo boat Dafni (completed 1913) is alongside. 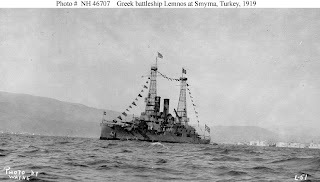 Lemnos was the former USS Idaho (Battleship No. 24). US Naval Historical Center Photograph. Click on photograph for larger image. 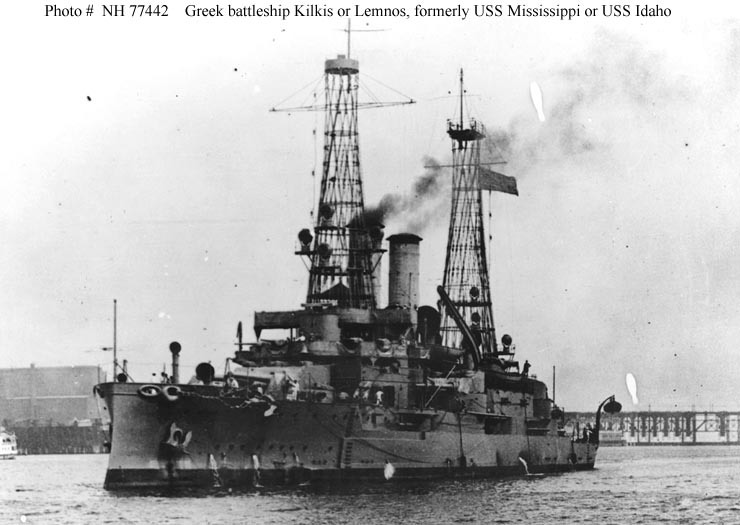 Figure 12: Greek battleship Kilkis or Lemnos photographed in a US port. 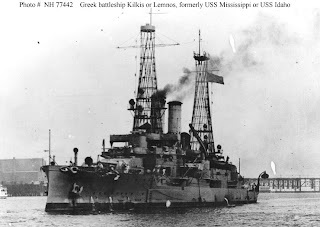 Kilkis was the former USS Mississippi (Battleship No. 23). 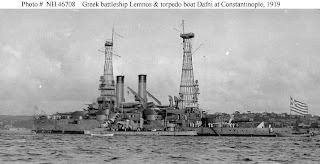 Lemnos was originally USS Idaho (Battleship No. 24). Courtesy of the US Naval Institute. US Naval Historical Center Photograph. Click on photograph for larger image. 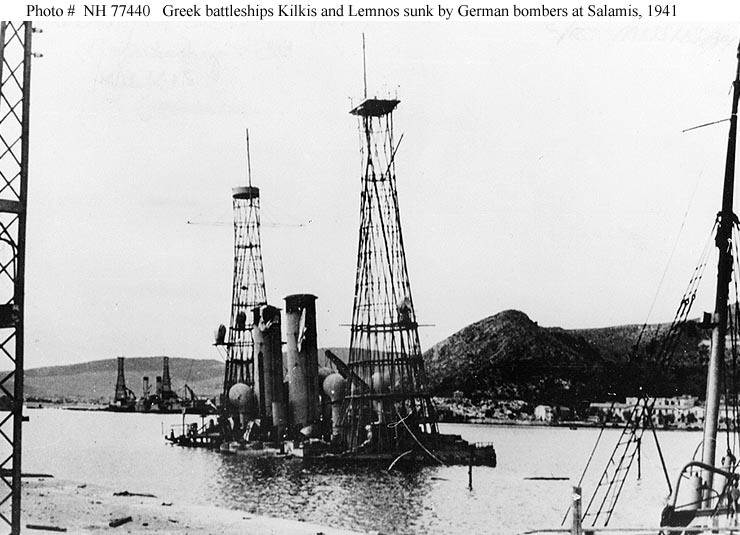 Figure 13: Greek battleships Kilkis and Lemnos sunk in the basin of the Greek naval base at Salamis after they were hit by German air attacks on 23 April 1941. Seen from the harbor pier following the arrival of the German army. Kilkis, the former USS Mississippi (Battleship No. 23), is in the foreground. Lemnos, ex-USS Idaho (Battleship No. 24), is in the distance, with her guns removed. Photograph and some caption information were provided by Franz Selinger, via the US Naval Institute. US Naval Historical Center Photograph. Click on photograph for larger image. Named after the state of Idaho, the 14,465-ton USS Idaho (Battleship No. 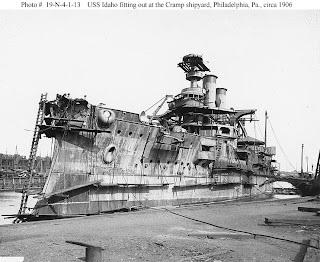 24) was a Mississippi class battleship that was built by William Cramp and Sons at Philadelphia, Pennsylvania, and was commissioned on 1 April 1908. The ship was approximately 382 feet long and 77 feet wide, had a top speed of 17 knots, and had a crew of 836 officers and men. 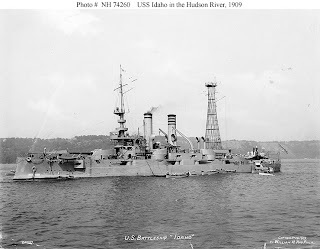 Idaho was armed with four 12-inch guns, eight 8-inch guns, eight 7-inch guns, 12 3-inch guns, two 1-pounders, and two 21-inch torpedo tubes. 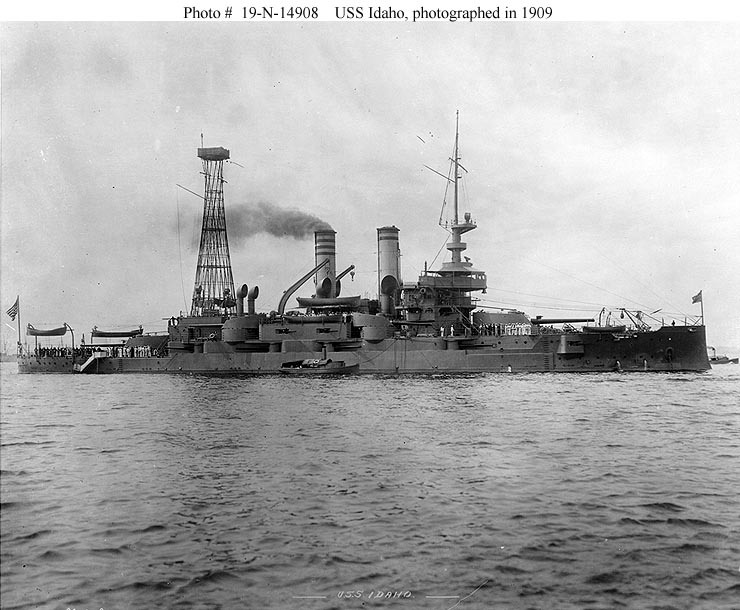 Idaho and her sister ship USS Mississippi (Battleship No. 23) represented the US Navy’s final design of what would soon be called “pre-dreadnaughts,” battleships with a main battery of two or more different-sized guns. Congressional action limited their displacements, a response to the rising size and cost of battleships. The two ships, therefore, were smaller, slower, and shorter-ranged than their contemporaries, though their armament was similar in power. Operationally, the Navy viewed them as inadequate because of their small size, short range, and slow speed, which made them prime candidates for early disposal. Following operations in the Caribbean area and a period of shipyard work, Idaho participated in the February 1909 naval review at Hampton Roads, Virginia, celebrating the return of the “Great White Fleet” from its around-the-world cruise. Over the next five years, Idaho served with the Atlantic Fleet along America’s east coast and in the Caribbean. 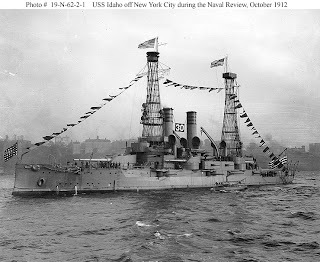 She also took part in naval reviews that at that time were frequent events at New York City. 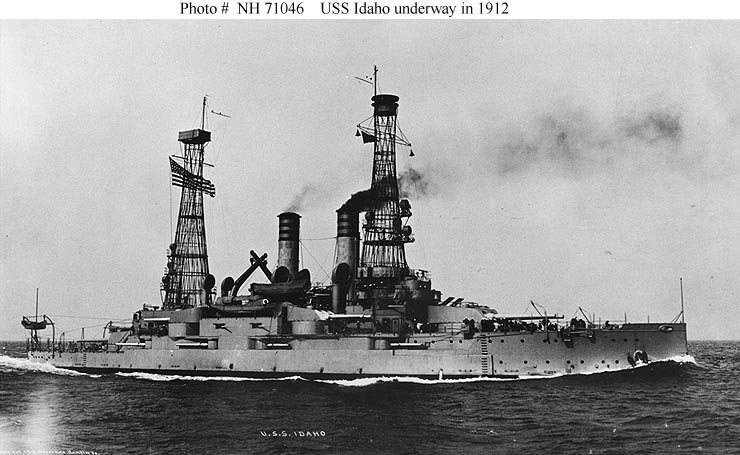 Idaho then visited France and England in late 1910 and cruised on the Mississippi River in 1911. In 1913, there was massive political unrest in Mexico due to a coup d'etat carried out by General Victoriano Huerta in February and the subsequent controversial death of deposed President Francisco I. Madero (shot and killed while "attempting to escape"). Secretary of the Navy Josephus Daniels observed that it had "been considered advisable by the administration [of President Woodrow Wilson] to maintain three or four battleships of the Atlantic Fleet in Mexican waters because of the very disturbed conditions in most of that Republic." Those "disturbed conditions" still existed in the spring of 1913 and Idaho was one of the “three or four battleships of the Atlantic Fleet” to be deployed to Mexico, first to Tampico from 23 April to 22 May, and then to Vera Cruz from 23 May to 22 June. 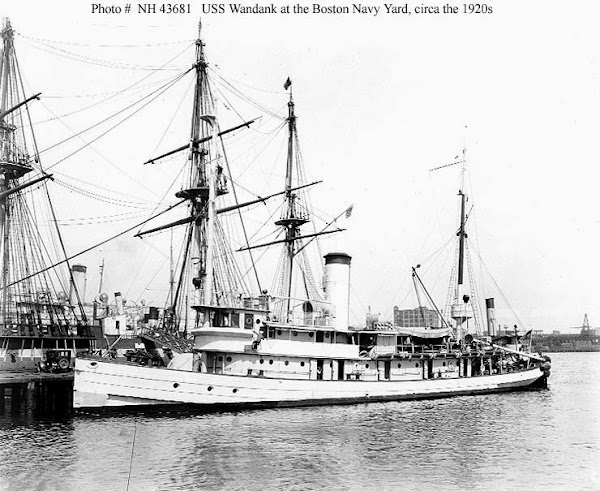 Idaho rejoined the Atlantic Fleet at Newport, Rhode Island, on 30 June. After completing some training exercises off the coast of New England, Idaho steamed to the Philadelphia Navy Yard at Philadelphia, Pennsylvania, and was placed in the Atlantic Reserve Fleet on 27 October 1913. Re-commissioned at Philadelphia on 16 March 1914. Idaho left Philadelphia on 9 May and went to the US Naval Academy at Annapolis, Maryland, where midshipmen boarded the battleship for a training cruise to the Mediterranean. Idaho left Annapolis on 7 June, bound for the Mediterranean in company with USS Missouri (Battleship No.11), flagship of the Naval Academy Practice Squadron, and USS Illinois (Battleship No.7). Meanwhile, events were occurring elsewhere that soon determined Idaho's ultimate fate. Diplomatic tensions between Greece and the Ottoman Empire following the 1912-1913 Balkan Wars resulted in each seeking to buy powerful warships abroad that would enable them to control the Aegean Sea. Determined to be unsatisfactory for continued US service, Idaho, and her sister ship Mississippi, were sold to Fred J. Gauntlett, an intermediary, on 8 July 1914, who then transferred them to the Greek government. "Those battleships," wrote then-US Ambassador to Turkey Henry Morgenthau, "immediately took their places as the most powerful vessels of the Greek Navy, and the enthusiasm of the Greeks in obtaining them was unbounded." After visiting Tangier, Morocco, from 20 to 21 June 1914, and Gibraltar from 21 to 23 June, Idaho and her consorts visited Naples, Italy, from 27 June to 3 July. Missouri and Illinois then went on to England, while Idaho sailed to Villefranche, France, arriving there on 17 July. 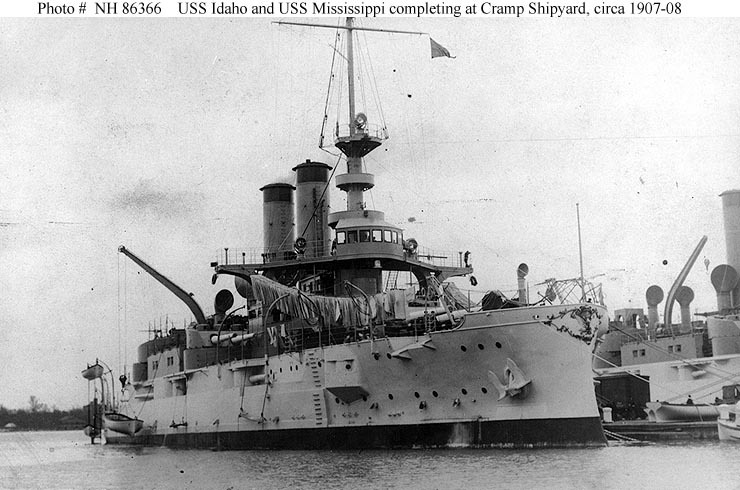 Idaho’s entire crew was then transferred to USS Maine (Battleship No. 10), which was also docked at the same port. On 30 July 1914, USS Idaho was decommissioned from the US Navy and, on the same day, was formally transferred to the Royal Hellenic Navy of Greece. 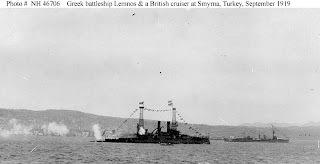 The ship was renamed Lemnos, in honor of a victorious naval battle over the Turkish Navy during the First Balkan War which took place in January 1913. USS Mississippi, which was also sold to Greece at the same time, was re-named Kilkis. These were the only US Navy battleships ever to be transferred to a foreign power. Lemnos and Kilkis were vital elements of the Greek Navy during World War I and Lemnos was active in Turkish waters during the chaotic period following the end of the war. Lemnos was taken out of active service during the 1930s, but was retained as a hulk. On 23 April 1941, as the Germans invaded Greece during World War II, Lemnos and Kilkis were sunk at the Salamis Naval Base by German dive bombers. They ended up being the first American-built battleships in history to be lost in a hostile air attack. More would soon follow in a place called Pearl Harbor.